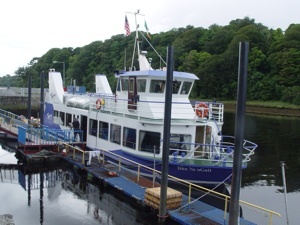 The Donegal Bay Waterbus is a 80foot long 86 ton, welded, steel boat built in Killybegs, Co Donegal in 2006. 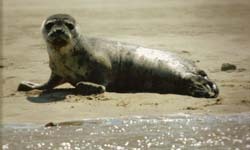 It has toured around Donegal Bay since July 2006 and operates all year round up to Christmas Day and New Year, carrying approxmately 35,000 passengers annually. The Donegal Bay Waterbus is a purpose built, luxury passenger boat, capable of comfortably taking 165 passengers; seated on lower and open top decks on a sight seeing cruise they will remember for the rest of their lives. Fully equipped with state-of-the-art navigational and safety systems, ladies and gents, wheelchair accessible, toilets and of course full bar facilities, where you can partake of a selection of wines, spirits, beers, as you sit on top-deck in the Donegal sunshine, or on the comfortable cushioned seats below, sailing around Donegal Bay, letting life's worries pass you by, and enjoying the odd sing-song. Moored at Donegal’s Toen Pier, Donegal Town Enterprise Ltd, administrated and operated by six working directors, as a matter of pride, is a non-profit making organisation, as all profits are ploughed back into the community, either through infra-structural works or indeed to charitable causes. This project is totally unique, as all the fully trained crew, who I might add are non paid, totally voluntary, went through a series of rigourous Dept of Marine programmes lasting several months, from Life Saving, CPR, Fire Safety, Radio and Sea Navigational Skills. 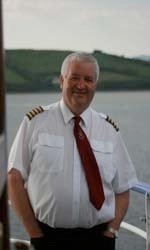 Waterbus Skipper, Billy Bustard, has been trained to the highest standards, involved in the white fishing industry for almost thirty years, owning several fishing trawlers and successfully skippered the old, 65ft Waterbus since 1997.
but are dependent upon weather and the tides. Tickets can be obtained from the ticket office on the pier. There is a detailed commentary on the sights during the trip.